Years before the Demon Wars in the land of Corona, Bran Dynard, a monk of the Abelle religion, returns to his home from a far-off land, with a book of mystical knowledge and Sen Wi, his beautiful and mysterious wife. 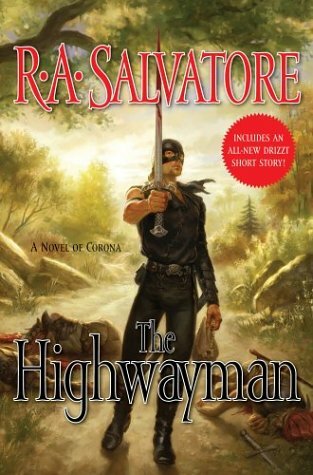 R.A. Salvatore's prelude to the Demon Wars Sagas The Highwayman is a stimulating ride into the early history of Corona and the vehicle is the creation a new, Drizzt-rivaling hero. Salvatore spins the tragic tale of an Abellican missionary who returns to Honce from the desert land Behr with wonders from the ancient Jhesta Tu monastery. At his side is his wife, a Jhesta Tu mystic. His dreams of uniting the teachings of the Jhesta Tu and "The Church of Blessed Abelle" are broken against the realities of bigotry and the young Abellican Church's struggle for political favor against the Druid-like Samhaists. But from their doomed union will rise a people's hero--the Highwayman.